Lass Naturals Peach & Apricot Shea Butter Lip Balm comes in a cute small plastic transparent round box with screw lid cap. It is very small box that we can carry with us anywhere, so it is travel friendly. The colour of this Lip balm is pretty pink and yummy too :p. The smell is very mild peach fragrance and natural. The texture is inside the box is solid pink creamy lip balm and when you take it on your fingers to apply, it melts on your lips like butter and delivers shiny look to the lips. I was so excited to try this lip balm when I opened this lip balm box and tempted to lick it :p, because it looks like a strawberry sweet jelly :D. Then I controlled myself and applied this lip balm on my lips. After applying the lip balm it delivers immediate shine and plumped look to my lips. My lips are normal type and pigmented brown in colour. This lip balm turned my lips pinkish brown hehehe because of the pink+Brown colour combination I think :p.
This lip balm helps me to keep my lips hydrated, soft and shiny. I tested it's staying power without eating or drinking anything, great it stayed up to 3 to 4 hours on my lips. obviously speaking and licking will take out the lip balm whatever you wear. The lip balm stays up to 2 to 3 hours with drinking and eating. Though the shiny thing will go if you eat or drink, the moisturizing power of the lip balm stays for sometime. I am loving this lip balm very much, for better than other lip balms. because, it is free from Parabens, Pathalets and Petroleum Jelly. I have no guilty feel of licking and swallowing (yes na we do this obviously) after applying a lip balm and get worried about swallowing chemicals on a regular basis :p. The another interesting thing about this lip balm is my dark brown lips getting change in the colour and seems pigmentation of my lips getting lighten. To see the confirmed results I was waiting for one month to review this lip balm. Now yeah the claims are true and my lips pigmentation getting reduced. You can't expect the over night results or miracle with this lip balm, as it is made up of natural ingredients, the results will be slow but study. The immediate results you can see is your lips gets soften and moisturized. Regarding pigmentation you have to use this lip balm regularly with patience which I did. I hope before finishing this lip balm I will get pinkish lips ^_^. Free from Parabens, Pathalets and Petroleum Jelly. Butter like texture, so no waxy feel. Moisturize and hydrates the lips well. 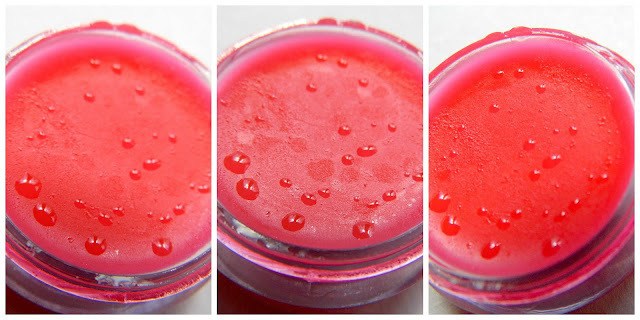 Gives shiny and plumping effect to the lips. Natural ingredients safe for us. Availability only online, Only Delhi has Lass Naturals Stores I think :). Lass Naturals Peach & Apricot Shea Butter Lip Balm is a good natural lip balm that is free from paraben and petroleum jelly, which can moisture, plump and reduce pigmentation by regular application. So do check www.lasscosmetics.com to get your lip balm. There are two other flavors pomegranate and Chocolate in this lip balm available. Nice review Radha! Gorgeous Product pics! Yeah yeah... Free from parabens is something great na Poo!!! This lip balm looks great!!! Have a lovely day my dear! The name itself sounds delicious Rads. I had checked their site after reading so many reviews from you about their products. Will order sometime. 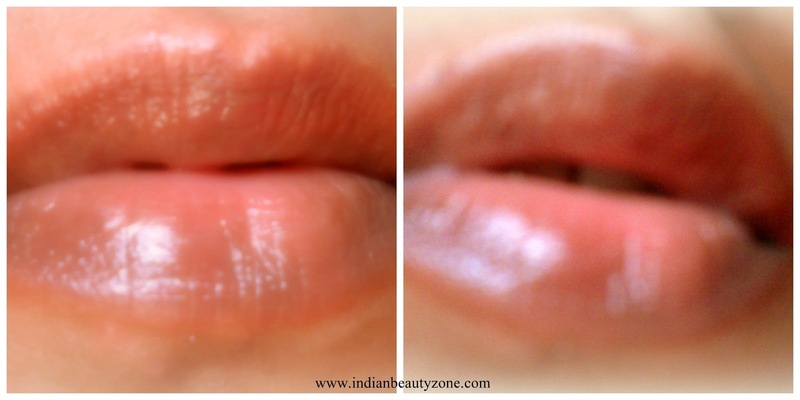 Your lips actually do look pinkish in the swatches :) Nice review. I dont think they have a store in delhi.. I really like the product as it reduces the pignenation on lips and yes its paraben free..
not the product for me, I don't like to apply products with my hands! Today on the blog, the new Jijil collection… let me know what u think about it! Great review Radha, you've found a wonderful product, xoxo. I am always on the look out for paraben free products! nice daily wear shade... and looks glossy too :) Nice review Radha..